Don’t wreck a good pair of scissors trying to cut metal; you need a good pair of tin snips. Snips look and work a lot like scissors, but they’re a lot more specific so you’ll probably need several different kinds. For cutting circles and curves, use hawk’s bill tin snips. Duckbill snips have narrow blades that easily cut straight lines, gentle curves, as well as screen and wire. 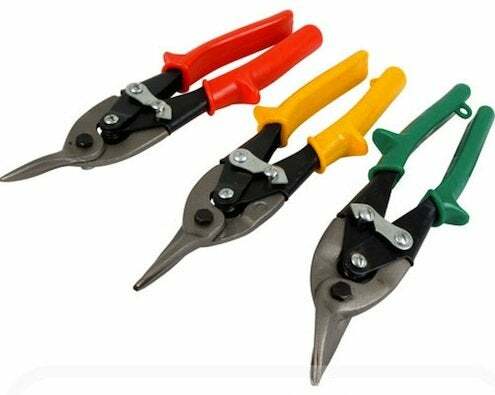 Aviation snips have a spring hinge for leverage and easy handling, and are good all-purpose tin snips. Choose tools with long, coated handles and serrated jaws to give you a good grip on your work. Tin snips are designed to cut curves in only one direction, so be sure you check the package to be sure you buy the ones you need. Red handles mean the snips cut to the right, curling off the waste to the left. Green handles cut to the left, and yellow handles are for straight cuts AND notching. But they’re all designed for right-handed use.